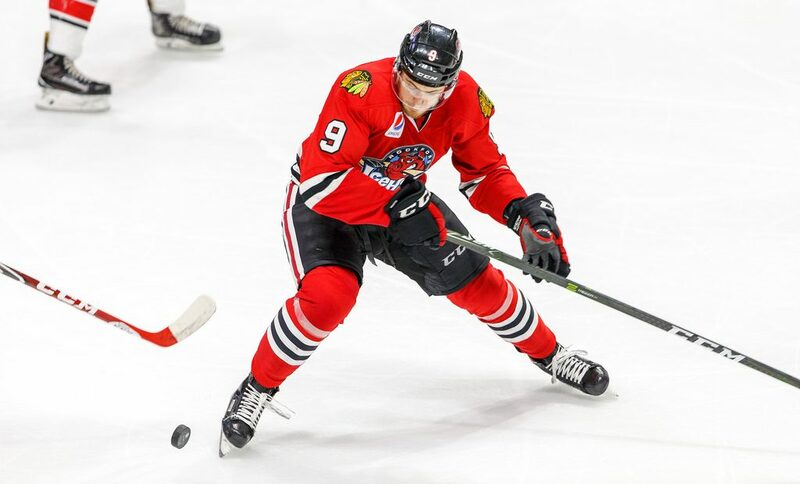 Tyler Motte of the Rockford IceHogs was active for the bulk of the team’s four-game road trip this past week. For all but about five minutes, Motte was either on the Rockford bench or on the ice. Those missing minutes did create a little activity widespread panic on my twitter account, however. As I will do on occasion, I was sending out tweets during the Hogs game in San Diego on Saturday night. With 5:23 left in the first period, Motte was maneuvering with the puck when his left skate appeared to catch a rut in the ice. His knee buckled and Motte went down awkwardly. The trainers went out and ushered the Hawks prospect to the locker room. Motte was putting no weight on his left leg whatsoever. It did not look good; my knee was a little sore from having watched it. Tyler Motte being helped off the ice after getting tangled up with Megna. Looks like a left knee or ankle injury. Definitely looks like his knee buckled beneath him. Would not expect to see Motte back in this game. During breaks in the action, I went back to look at the play several times. While trying not to assume the worst, I figured the best-case scenario was that Motte had tweaked his knee and would be held out for the remainder of the contest as a precaution. Worst case, Motte may be missing some time. Second period underway…and Motte is back on the ice! Did not expect that the way he came off, but great news. Motte finished the game without incident and played the next day in Ontario. Bullet dodged; the former Michigan standout can continue on with his season. Except that a lot of people didn’t get a look at that second tweet. I got a lot of re-tweets on the initial announcement of Motte being taken from the ice, which is totally cool. Not complaining at all; I was glad to keep folks informed about the Hogs. However, the aftermath resulted in ten times the people seeing the first tweet than the second one. It also led to re-tweets well after Motte made his return. Like well into Sunday. With so many folks responding, ranging from concerned to apoplectic, I felt a little bad not being able to reach everyone and talk them off the ledge. Once in a while, one of my tweets gets picked up by a player’s family; in this case, they would be in for some undue worry. All’s well that ends well, I guess. Motte seems to be just fine, as far as I can tell. By all means, keep re-tweeting my more coherent thoughts. Or, you could just follow me @JonFromi and get all my vociferous rantings straight to your phone or laptop. I will now remove my tongue from my cheek. Sunday, I was listening to the Hogs broadcast with Bob Mills and heard a familiar Hogs promo with a curious update. A couple of months ago, I was taking a look at the fact that fighting majors are down in Rockford. I mentioned this year’s IceHogs promotional campaign, which included the statement that Hogs games are “a beautiful combination of violence, speed, and intensity,”. It surprises me just a bit that the club would lead off that mix with “violence”. The IceHogs definitely try to get families into the BMO Harris Bank Center. You’d think that fisticuffs would be something the promotions department would put a little further down the list in terms of marketing the team. I don’t know how long the word strength has been substituted for violence. It’s the first time I’ve heard this updated spiel. I won’t presume that I have anyone’s ear at the BMO: someone who makes the promotional decisions in Rockford did decide to make a change in the script. For those interested, the IceHogs have been on excellent behavior in terms of keeping their gloves off the ice. As of Sunday’s game, Rockford had gone ten games without being assessed a fighting major. They are 7-3 during that stretch. Don’t take that to mean the Hogs are better off minus the extra-curricular antics; I don’t know that fights figure into the mix on either side of the win/loss column. I did a study of this last year if you’d care to go back and read it which bears this out. New AHL fighting restrictions notwithstanding, Rockford is currently missing Jake Dowell and P.C. Labrie. Brandon Mashinter was also out for a few games last week. Chris DeSousa may miss some time after being struck in the knee with a slap shot Saturday. Michael Latta, whose only scrap for the Hogs was back on February 7, has eight fighting majors (still tied for tops in the league) and is approaching the mandatory suspension plateau of ten. Back in 2014, Rockford’s Bobby Shea crawled underneath the police to try and get at Ty Rattie at the Allstate Arena and got eight games. Safe to say Gabriel gets a lengthy vacation and won’t be in uniform this weekend. Rockford has just 26 fighting majors on the season. In a year where fights are down all over the AHL, that total is still tied for tenth in the league. At this rate, the IceHogs are on pace for just 35 fights in 2016-17. That would be an all-time franchise low. Thursday, Rockford released Jeff Glass from his AHL deal so that the Blackhawks could sign him to a two-year contract. Glass went through waivers and was assigned to the IceHogs by Chicago. 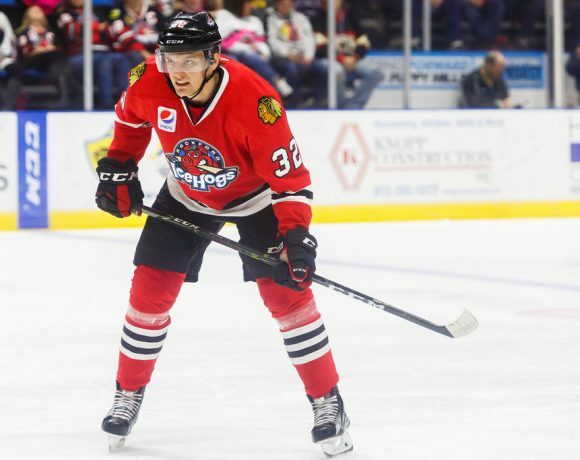 Vinnie Hinostroza came back down to Rockford in a move on Friday, playing in both Saturday and Sunday’s California games. Sunday afternoon, Chicago recalled Lars Johansson, leaving Glass and Mac Carruth to man the nets for the Hogs. Johansson was re-assigned to Rockford Monday afternoon. The road trip got off to a promising start in Winnipeg. The IceHogs won away from the BMO for just the sixth time this season. Rockford gained a 2-0 first period advantage off the stick of Brandon Mashinter. The big forward, who had missed the Hogs last three contests, got the scoring started when he got to the front of the net. Mashinter knocked in a rebound of a Erik Gustafsson shot. The power play tally came at 9:45 of the first period. Less than three minutes later, Mashinter scored when he went to practically the same spot in front of Moose goalie Eric Comrie. Sam Carrick’s shot came off Comrie’s pads; Mashinter stuck the rebound into the cage for a two-goal lead at the 12:35 mark. Manitoba quickly closed the gap in the second stanza, scoring on goals by Nolan Zajac and Scott Glennie in the first two minutes. The game remained a 2-2 contest until the early stages of the third period. Kyle Baun broke the tie 3:03 into the third with an unassisted snipe from the high slot. The two-goal lead was restored when Martin Lundberg beat Comrie to the twine at the 5:04 mark. Rockford had a power play chance to nail the game shut in the 13th minute. However, Brian Strait drove to the left post and cut the lead to 4-3 with a shorthanded goal at 14:32. That was as close as things would get in the waning minutes. Manitoba pulled Comrie in the final minutes but the Hogs did not allow the equalizer. Mashinter nabbed First Star honors, while Gustafsson’s two helpers on the night earned him the game’s Third Star. Jeff Glass stopped 27 shots to pick up the win. Lars Johansson was the difference for Rockford, stopping all 35 shots the Moose threw at him to give the Hogs a hard-earned two points. It was a clinic in both creases Wednesday. Eric Comrie was nearly Johansson’s equal, holding Rockford scoreless through regulation and overtime. The IceHogs killed four penalties over the course of the game. Though they were out shot 35-27, Rockford had its share of chances. The shootout was decided by the first Hogs shooter; Spencer Abbott deked Comrie out of the net and tucked the puck into Goalsville. Johansson stopped attempts by Kyle Connor and Dan DeSalvo before ending the contest with a spectacular falling save of Jack Roslovic’s final round try. Johansson, of course, was named the game’s First Star, followed by Comrie and Abbott. An early lead did not hold up for Rockford. The Gulls put an end to what was a three-game road win streak. Rockford drew first twine 1:31 into the first period on a fabulous bit of passing. Jeremy Langlois got the scoring play started by winning possession of a dump in and bringing it out to the top of the right circle. Mark McNeill was waiting at the left circle and one-timed the cross-ice feed to Kyle Baun at the right post. Baun merely had to let the puck hit his tape; San Diego goalie Kevin Boyle never had a chance. Up 1-0, the Hogs lead soon evaporated. Brandon Montour got a slap shot from the blue line past a screened Jeff Glass at 5:47. At 12:16, Jaycob Megna skated into the slot and beat the Rockford goalie’s glove for a 2-1 advantage that held up as the teams went to intermission. The IceHogs evened things up early in the second period, taking advantage of a power play opportunity. Ville Pokka gathered in a long rebound of Michael Latta’s attempt, caught Boyle out of position and sent the biscuit home at 4:08. At the 4:28 mark of the final frame, the Gulls regained the lead when Tyler Morley got control of a loose puck at the right circle and beat Glass to the glove side. Morley’s goal proved to be too much for Rockford, who couldn’t come up with the equalizer. Tyler Motte was helped from the ice after his left leg buckled beneath him while the Hogs were on a 4-on-3 power play. He returned to action the next period. Chris DeSousa left the game in the middle of the third when a slap shot struck him on the left knee; he did not return. The IceHogs kept battling but dropped another one-goal game to end their swing out West. Ontario scored 51 seconds into the contest when Brett Sutter put back a rebound of a Mike Amadio shot that caromed off the pads of Jeff Glass. The IceHogs returned fire on the power play less than a minute later. Spencer Abbott redirected Ville Pokka’s blast into the cage, beating Reign goalie Jack Campbell at 1:44 of the first period to tie the score at one. Rockford fell behind two goals in the first six minutes of the middle frame but rallied to tie the score. Abbott got his second of the night at 8:20; a long-distance wrist shot from way above the right circle. A few minutes later, Carl Dahlstrom skated into the slot to send Brandon Mashinter’s dish to the back of the net. The Reign went up 4-3 when Kyle Brodziak got to his own rebound and sent it past Glass at 15:47. The teams skated to the dressing rooms with Rockford down a goal. Ontario restored the two-goal advantage 11:44 into period three with Sutter’s second goal of the evening. Again, the Reign forward took advantage of a rebound, sticking Amadio’s attempt through the wickets of Glass to put his team up 5-3. The IceHogs made a run late, pulling Glass for an extra skater with 2:25 remaining. Mashinter gathered a Gustav Forsling shot off the end boards and flipped the puck past Campbell to close the gap to a single goal with 1:23 left. That’s as close as Rockford got, however. Rockford is back in action Tuesday night at the BMO Harris Bank Center when they host the first of two games with Manitoba. The Moose remain in the Forrest City for a Friday tilt. Saturday night sees the Iowa Wild coming to town. Follow me @JonFromi on twitter for all sorts of babbling concerning the IceHogs, including game updates and whatever thoughts I can throw out there.